The Galaxy S9 and S9 Plus — Samsung’s flagship phones for 2018 — have finally landed! 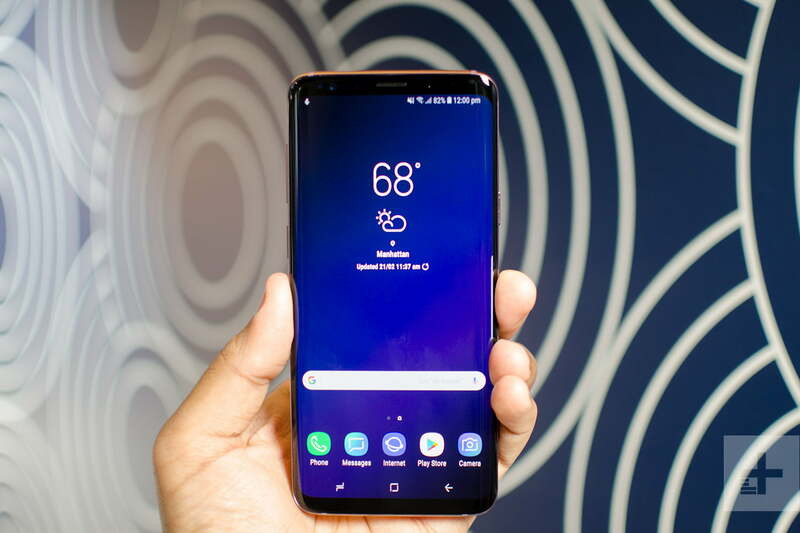 The smartphones are similar to the Galaxy S8 and S8 Plus, except they’re faster, sleeker, and come loaded with a bunch of new features, including a variable aperture camera. Here’s everything you need to know about the two devices, whether you’re looking for camera details or those pertaining to each phone’s display and processing power. At first glance, it may seem like the Galaxy S8 and S9 are the same phone, because both models tout a Quad HD Super AMOLED screen, 18.5:9 resolution, and either a 5.8- or 6.2-inch display (depending on the model). Upon closer inspection, however, you can see there are some subtle differences; the bezels on the Galaxy S9 are smaller than those on its predecessor, the topmost sensors are better hidden, and the fingerprint sensor on the back has been repositioned. The phone is also IP68-certified — meaning it’s protected against dust and temporary immersion in water — and like the Galaxy S8 and S8 Plus, it supports both fast charging and fast Qi charging. On the left side of the phone you have the volume rocker and Bixby button, the latter of which Samsung has promised to improve this time around, while the right houses the power button. On the top, you’ll find the SIM card and microSD combo slot, and on the bottom, a USB-C charging port, headphone jack, and one of two stereo speakers. The Galaxy S9 utilizes the Qualcomm Snapdragon 845, the latest version of said processor. The S9 also comes with 4GB of RAM, while the Plus touts 6GB. Both phones support Gigabit LTE, with peak download speeds of 1.2 gigabits per second. The S9 also features a 3,000 mAh battery, while the Galaxy S9 Plus, which is logistically bigger, features a 3,500 mAh battery. In terms of privacy and security, the S9 features a repositioned fingerprint scanner on the back, located directly beneath the camera(s). It also comes with iris and facial recognition, both of which can be used to unlock your device. This is where the Galaxy S9 Plus really shines. Both the S9 and S9 Plus feature a front-facing 8-megapixel camera with a f/1.7 aperture lens, as well as a 12-megapixel camera on the back with an adjustable aperture from f/1.5 to f/2.4. The S9 Plus, however, houses a second 12-megapixel shooter on the back. This telephoto lens comes with a fixed 2.4 aperture, allowing for better shots in low-light scenarios. If you’re shooting in Pro Mode, the controls for the rear-facing camera let you manually switch between 1.5-aperture shots (for low lighting) and 2.4-aperture shots (for brighter settings). You can also set it to Auto Mode, which will prompt the device to automatically switch between the two settings depending on the lighting conditions at hand. The S9 Plus also comes with Panorama Mode and Live Focus, a setting from the Note 8 that allows you blur the background with greater ease. There is also a Selfie Focus Mode, which allows you to blur the background using the front-facing camera, as well as Regular Selfie Mode, Wide Selfie Mode, and AR Emoji (more on that later). When recording in Super Slow Mo, you can capture 720p videos at 960 frames per second, but only for a split second. The feature can be used manually or will automatically engage when the camera detects movement while using the app. The S9 has a continuous slow-mo feature that can capture 1080p videos at 240 fps as well, but unfortunately, it wasn’t available on the phones we tested, so it’s usability is still TBD. 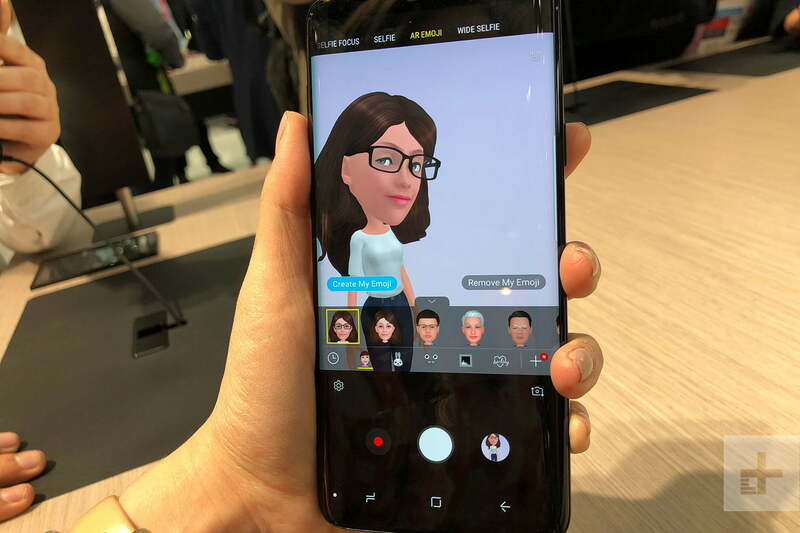 AR Emoji is a new feature exclusive to the S9 and S9 Plus, one that lets you use selfies to create emojis that looks just like you (or at least some version of you). There are currently 14 pre-determined poses you can use in GIFs, and you can use your emoji avatar to send short video clips to your friends. Other characters can be used in the app as well, and as a result of a recent partnership with Disney, characters such as Micky Mouse and Elsa will be coming to the device shortly. Make-up Mode and a wine bottle scanner powered by Vivino also allow you to try on makeup or learn more about the bottle of wine you’re drinking (including the cost and tasting notes). On the operating side of things, the Galaxy S9 and S9 Plus run Android Oreo, with Samsung’s proprietary UI on top. Samsung’s virtual assistant, Bixby, has also received an overhaul. The feature can scan items, for instance, and let you shop for them via partners such as Nordstrom’s and Sam’s Club. Another forthcoming feature will allow you to take photos of your food and automatically input their nutritional data into Samsung health. There are also several apps designed to help you get around. The first, Translations, allows for the real-time translation of text, while the second, Places, allows you to identify landmarks via your camera. There are also the normal Samsung apps, including SmartThings, Voice Recorder, My Files, Internet, Samsung Health, Galaxy Health, and Samsung Gear.